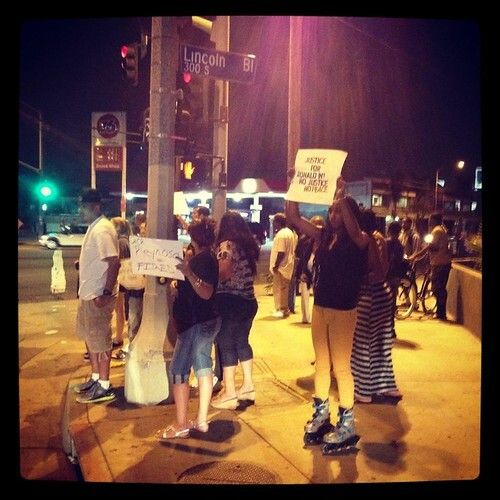 Supporters of Ronald Weekley Jr Protest LAPD Beating on Rose - Yo! Venice! Friends and supporters of skateboarder Ronald Weekley Jr., who was punched in the face by an LAPD officer over the weekend, are presently (9pm) gathered at Rose and Lincoln to protest the LAPD. Nearby, an LAPD helicopter and 20+ cop cars are searching for a guy in a grey hoodie in the 700 block of Brooks (they were on Vernon a few minutes ago). Captain Brian Johnson of Pacific Division and Mike Bonin, the Chief of Staff for Bill Rosendahl, will be at the Venice Neighborhood Council Board Meeting meeting tomorrow evening. Captain Johnson will answer questions about the Ronald Weekly arrest and face smashing.